At the end of 1980, Air-Bridge Carriers (ABC) maintained a number of cargo-flights out of England to Eelde airfield in the Netherlands by which large numbers of calves were flown over. ABC used the Merchantman and the AW650 Argosy 101 on these flights. On 31 October 1980, Air-Bridge Carriers' Vickers V.953C Merchantman G-APEK was photographed, painted in the basis colours of British Airways, the previous owner. In 1957, the G-APEK was ordered in 1957 by BEA as a V. 951, but on 30 August 1961, the airframe flew first as a V. 953 Vanguard, a 139 persons passengers airplane. 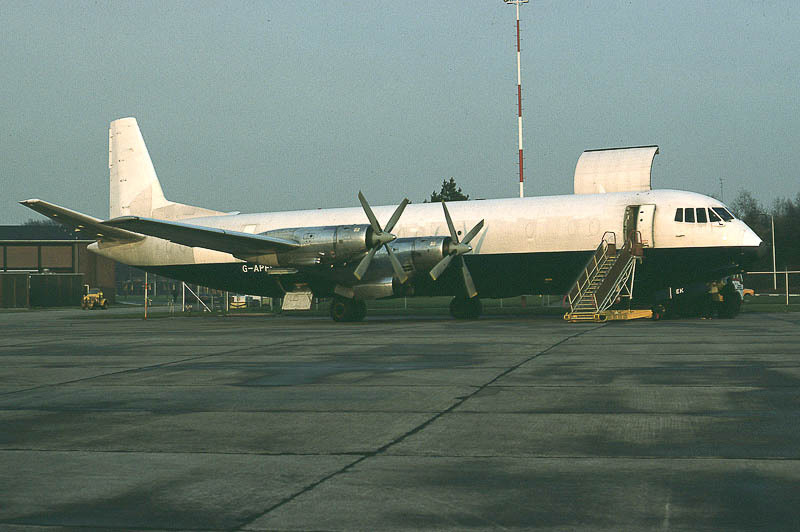 In October 1969, the G-APEK was withdrawn from use by BEA and converted into a V.953C Merchantman cargo aeroplane. The aircraft entered service after the conversion with BEA on 17 February 1970. After the merger of BEA with BOAC, etc. the G-APEK became part of the British Airways fleet. On 5 November 1979, the G-APEK was sold to Air Bridge Carriers (ABC). After Air Bridge Carriers the G-APEK had leased to ICS - Inter Cargo Service, the Merchantman was put in storage at Perpignan. In 1992 Air Bridge Ltd. was renamed Hunting Cargo Airlines Ltd. However Hunting Cargo Airlines became the registered owner of the G-APEK, the freighter remained in storage at Perpignan. After the airframe was permanently withdrawn from use, registration G-APEK was cancelled on 6 November 1996. Finally the aircraft was scrapped at Perpignan in France.